On April 1, the release conference of “the Annual Scientific Report on Kidney Diseases in China” and the Joint Symposium of China Kidney Disease Data Network (CK-NET) were held at the International Cooperation and Exchange Center of Peking University Health Science Center (PKUHSC). Nearly 30 department directors and colleagues in Nephrology and approximately 100 experts and scholars from collaborative universities and research institutes attended the conference. Academician Zhan Qimin, PKU Executive Vice President and PKUHSC President, delivered a speech at the conference. He gave a high affirmation to the report and said that the construction of CK-NET and the compilation of the Annual Scientific Report on Kidney Diseases in China are actually one of the practical tasks under the PKU Medicine Development Strategy. CK-NET provides a good model for decision support of major chronic diseases prevention and control, and takes a good step in the innovation of big data science and technology. Professor Chen Jianghua, Director of the Branch Society of Nephrology under the Chinese Medical Association (CMA), congratulated on the release of the report of CK-NET and acknowledged the research and innovation of the CK-NET team over the past ten years. After that, Vivekanand Jha, President-elect of the International Society of Nephrology (ISN), Pierre Ronco, editor-in-chief of Kidney International, and other foreign nephrologists also sent their video congratulations, fully recognizing the quality and content of the annual scientific report of CK-NET, and hoping that in the future, CK-NET will continue to make efforts to provide more dimensional basic data for the study of kidney diseases in China. 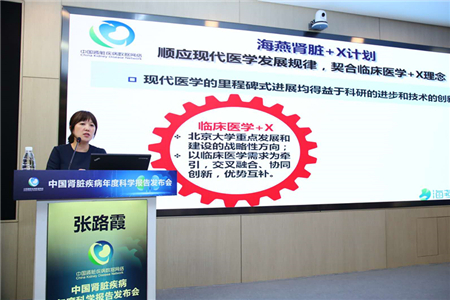 Professor Zhao Minghui, Director of Nephrology Department of Peking University First Hospital, made a presentation at the conference, sharing the construction process of CK-NET and introducing the major contents of the report. Meanwhile, the "Haiyan Kidney+X" project was also launched. 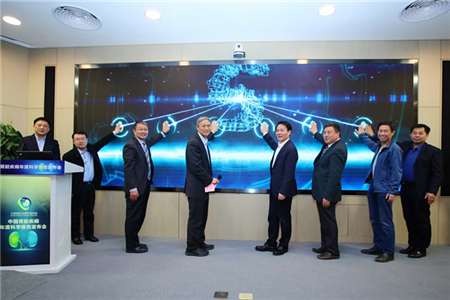 Professor Zhang Luxia, assistant director of PKU Center for Data Science in Health and Medicine, said that the project is dedicated to promoting the cross-integration of superior resources and cutting-edge technologies in clinical medicine, aiming at bringing benefits to medicine by focusing on medical needs and making use of data in health and medicine.